Having greasy hair can make you less confident because greasy hair look dirty and dull. What causes greasy hair and how to get rid of it? Consider the following tips. Greasy hair not only causes appearance looks bad, but it can also lead to other problems such as dandruff, acne on the scalp and hair loss. Actually, in the hair follicles there are sebaceous glands that produce sebum (oil that helps keep skin and hair moist and shiny). But in certain people oil content is higher or excess than other people. Causes of greasy hair is the result of overactive oil glands that make the oil content in the hair becomes excessive. Here are some things that are known to affect the activity of the sebaceous glands before becoming sebum. Hormonal changes that occur when a person reaches puberty, menopause, stress or taking hormone medications (such as oral contraceptives) will make your hair become more oily. During puberty, hormonal fluctuations in the body including the androgen, the hormone serves to control the oil glands that make a person's hair more oily. Oily hair due hormonal changes are usually only temporary. People who have hair and oily skin also is usually genetic. This condition will make a person has greasy hair more than others throughout their lives, and certainly difficult to overcome due to genetic factors. Environmental factors such as heat or humidity of the air temperature can make hair greasy. In addition, external factors such as perspiration, smoke, and even excessive make-up will make your hair greasy. In addition, the use of products that are not designed for oily hair types tend to add to the problem. 1. Choose suitable shampoo designed for greasy hair and wash your hair every day. Shampoos that contain detergents to help control the oil in the scalp. When shampooing, massage your scalp with shampoo gently and let stand for a few minutes before rinsing. Repeat again, the process. Then rinse thoroughly. 2. If you want to use a conditioner, choose a conditioner that is designed for greasy hair. Use the ends of the hair only and should not be exposed to the scalp because it can make the hair more oily. 3. Try not to brush too often and do not comb to the scalp. 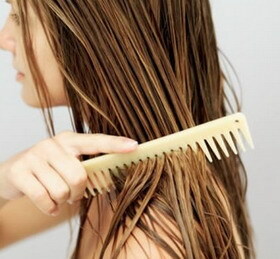 Comb your hair too often can stimulate excess oil production. Reduce oily food and junk food. These foods increase the oil in the body which increases the oil in the hair. Therefore eating vegetables and fruits are highly recommended for the health of the scalp. Do not use the product to make hair shiny like serum and products for curly hair. These products contain the extra moisturizer that will make your hair more greasy. Powder will absorb excess oil. But put the powder on the base of the head should only be in an emergency just because a given effect will not last long. Make sure the hair is washed thoroughly afterwards.